Also, if I was absurdly rich, I would build my house/castle to resemble ancient ruins. I mean, that would be totally awesome and atmospheric. Add in some puzzles that guests must solve in order to navigate the place, and we're in business! I like your idea. We could all feel like Indiana Jones when we visit you and sleep in really cool rooms...maybe some previously owned tombs for a bed! The cheese and cracker sweethearts are one of your most endearing couples ever, and all that without the help of facial features. Huzzah! 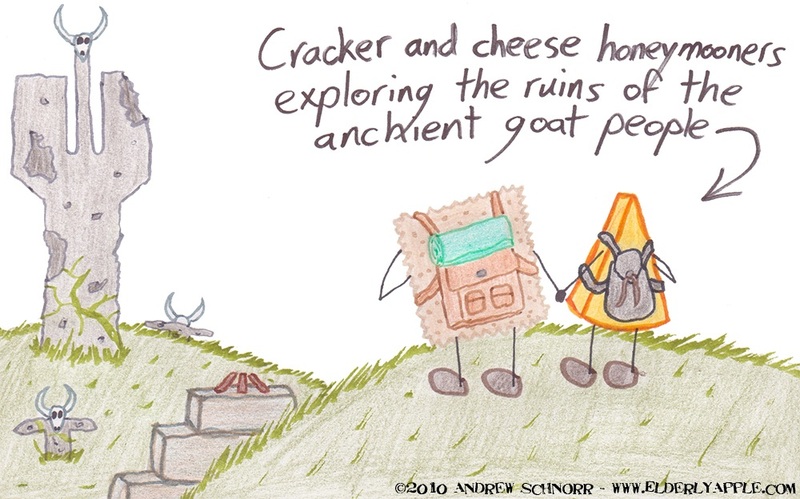 Hmmmm, cheese and crackers - what a wonderful union. so, which one's the chica?